Aside from the embargo and the cigars and the communism, the biggest thing people think about when they hear Cuba is the number of old American cars roaming the streets. Now that the country is opening up the sale of new and used cars to the general public, you'd be right in thinking people will ditch their old cars for new ones. Except that it's probably not going to happen. Cuba's move to let more people buy post-1959 cars is both a symbol of its changing attitudes towards Communism and the growing need to give citizens more advanced technology. Some things don't change, though, as the state will still control the sales and it's still basically impossible to import a car on your own. A year and a half ago, I spent a month studying photography and culture in Cuba. That included Cuba's car culture, which was unlike anything I'd seen. There are few places that have so many people trying to save machines that are so past their sell-by date. Classic cars like a 1937 Pontiac I saw sit out on the street, but start every day and go to work every day. What's more, it's very common for them to be passed down between generations. That's not to say some efforts at modernization haven't already happened. Ladas have been fixtures for decades as police cars and cabs and are just as iconic there as the American cars. They're being superseded now by Geely CKs because the Ladas are getting old for government use, even though you can pretty much fix them with two rocks and a banana. There was another man I remember who had a Moskvitch 2141, and was quite proud of the car. He had nothing bad to say about it, probably because he figured it was probably going to be the only car he'd ever own. Forget moving up social classes, trading up your car was never going to happen for him. "Yeah, I can buy it, but with what? Unfortunately our economy doesn't allow us to save money to be able to buy it." Everyone might have an education in Cuba, and pretty much everyone is employed. But people are still forced to take what they can get. A major reason owning a new car is such a hardship is because of the lack of parts. The only car outlet I saw was a Fiat service shop, and the cars there were mostly Tempras and Polski 126s. No one has a new 500. New cars are fairly commonplace in Havana. Rich tourists from places like Italy and Germany already rent new SEATs and Peugeots from car agencies. If you have a car, you probably needed it already. 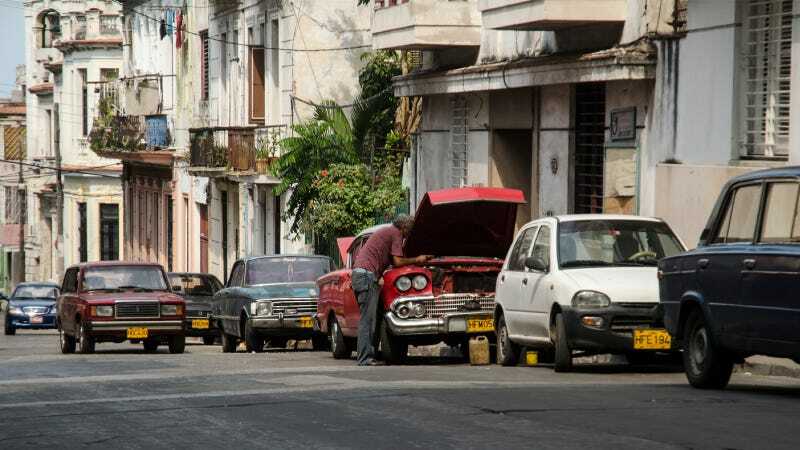 Most Cubans can't afford the fuel or the maintenance of a car, and therefore have no use for one anyway. The people who need a reliable car for work and can afford a shiny Peugeot 206 will now be able to get one without nearly as much bureaucracy as before. But those who cherish their old Russian and American iron are going to hold onto them. It's because they're the same people who like having digital cameras and Pringles in Havana, but also understand everything shouldn't — and won't — change all at once.